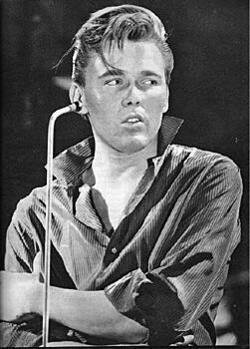 Liverpudlian Ronald Wycherly aka Billy Fury became part of the Larry Parnes stable of British Rock n Rollers in the late 1950's along with artists such as Marty Wilde. 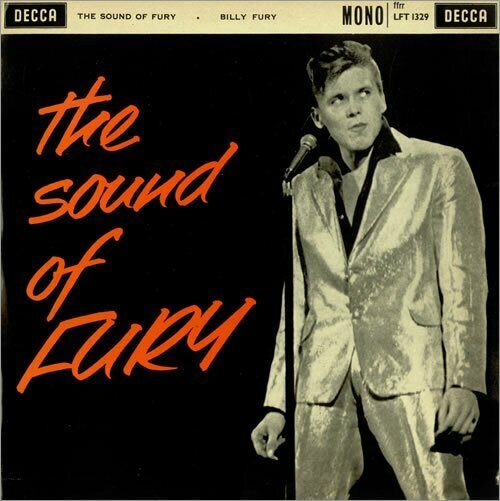 He is mainly famous for his ballads such as Halfway to Paradise, however Billy Fury stands alone in that he wrote virtually all the songs on the legendary Sound of Fury Album and most of these were in a rockabilly style not previously heard of by a British artist. 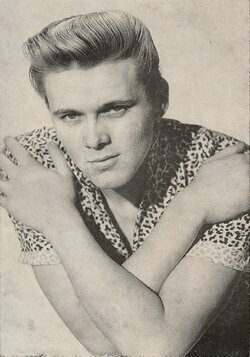 Billy Fury was a member of the Larry Parnes stable of singers in the late 1950s / early 1960s. Next day, he and his guitar joined the tour and Billy made his professional debut that night in Stretford. He made the 'Sound Of Fury' 10-inch album, a rockabilly collection of self-penned numbers, which remains many fans' favourite recording. Every song was recorded during two, three hour sessions. Among the backing instrumentalists is Joe Brown, later to have a number 1 with Picture Of You, and still touring today. For backing vocals, Billy flew the Four Jays from Liverpool at his own expense. The drummer, Andy White, played drums on The Beatles' Love Me Do when Ringo was declared inadequate. One of the groups that auditioned unsuccessfully to become Billy's backing group comprised Johnny Hutch (standing in for Tommy Moore on drums), Stu Sutcliffe, John Lennon, Paul McCartney and George Harrison. For the first time, they called themselves The Sliver Beetles. According to pop legend, they were offered the job at £20 a week each if the inexpert Stu Sutcliffe was dropped as bass guitarist, but John Lennon (who had earlier secured Billy's autograph) refused to desert his friend. A live TV show and a national promotional tour followed, but at 2.10pm on 28th January, 1983, he was pronounced dead on arrival at St Mary's Hospital, London, after being found unconscious in his flat in Cavendish Avenue, St John's Wood. He apparently died in the ambulance.